← How am I smart? 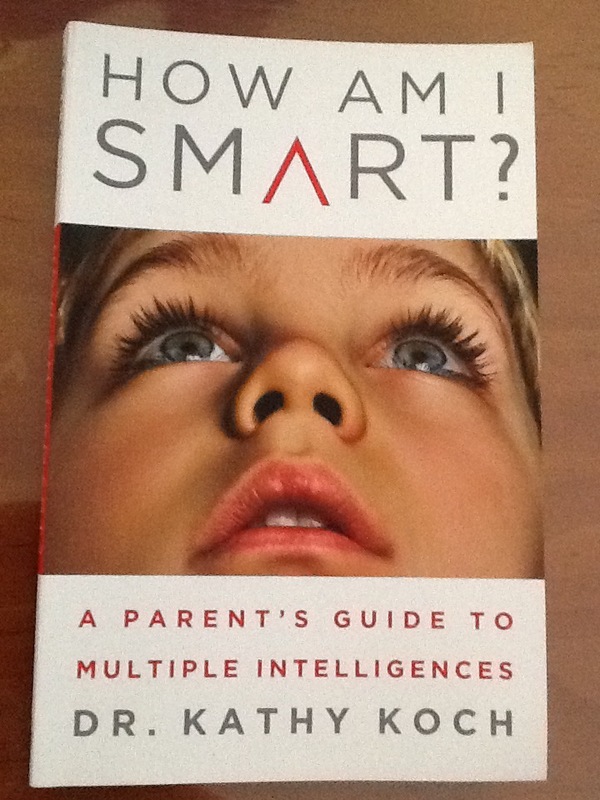 Last blog post I wrote a brief summary of the book “How am I smart?” by Dr. Kathy Koch. I found the book extremely helpful as it explains that all children are smart but in different ways. We just need to help our children identify their strength and teach to that strength. Plus, everyone usually has more than one ‘smart’/strength. I also highlighted the characteristics of people who are ‘word’ smart. Since then, I have been inundated with people wanting more information on the other ‘smarts’. I have been tardy with this, so I am sorry. Life has become quite full with juggling numerous roles, and I have chosen to spend time with our children reading to them instead of time on the computer. We are devouring books set in Russia from the 1960’s – 1980’s, based around christian children having to make decisions based on whether they obey God or the Government. There is also a series I managed to get my hands on that are brilliant and have prompted a lot of conversation about what we would each do in certain cirumstances. I highly recommend them to you. They are the “Ivan” Series (Ivan and the Informer, Ivan and the Hidden Bible etc) by Myrna Grant. Very suitable age wise for my 9 year old son and my 12 year old daughter is interested as well. Along with that, Matey (9) has collected over 1000 pairs of brand new socks in the last 3 months for homeless people and it has necessitated the whole family becoming involved and supporting him. We have distributed many of them by helping at meals / food vans for homeless people and we have learnt a huge amount in the process. Something I would also definitely recommend. This blog post, I will cover the next 2 smarts – Logic smart and Picture smart. Logic smart people want everything to make sense, to them. It may not necessarily make sense to you and you can easily shut down your child in this strength by your negative response when you think they haven’t made sense. They love it when you say to them, “Keep talking, tell me more about why you believe that” or when you curiously ask “Help me understand why you did that”. Competence: they love thinking, common sense reasoning, love exploring unknown topics, brainstorm questions well. They tend to think with questions and when they are excited, ask a lot of questions. This may help them get excellent grades as answering written questions plays a significant role at school. They have a high need to know ie to know all the details for an assignment. They can pick up when things aren’t normal and they need things to make sense. They may realise something is amiss with your family life with eg grandparent being sick, daddy losing job etc without being told. Will usually ask ‘why?’ You can easily paralyse them in this smart by shutting down their ‘why’s’ and getting frustrated with all their questions. (I can totally relate to that with different Sunday School students I have had over the years plus one of my own children who frustrated me with all their questions until I realised that this was an essential part for their learning.) Bored Logic smart children can be dangerous as they need something to think about and be challenged. If not, they will look for unusual answers, eg take something apart, which can come across as naughty. They usually enjoy science and accurate, research driven thinking and experimenting. Maths is usually a strength. Usually love reading non fiction or mysteries. Learning and Teaching Methods: they need to ask and answer questions to learn best. They love problems to solve. Teach them how to specifically think eg define, distinguish, evaluate, predict etc. Methods to try include brain teasers, timelines, research, debate, data collections, asking why and how questions, fun trivia, field trips, open ended exploration, etc. Saying “That’s not important” can be extremely hurtful to these children and can shut them down. Identity: they may get frustrated with reading or reading stories that don’t make sense eg a talking animal, and thus prefer non fiction. Spelling and phonics can challenge them, especially with rules that don’t always work. Struggles: they can create problems through their thinking. Their curiosity can lead to sin when they aren’t guarded eg how drugs work, look at stuff they shouldn’t etc. They can easily worry about stuff that they see that disturbs them eg if a grandparent suddenly starts ringing a lot more frequently etc. They can also get into trouble by challenging adults eg don’t step over that line – there are many places to put their foot on the line, in the air over the line, without technically stepping over the line. Purpose: they usually need to realise that they don’t need to know everything about God before believing in Him. They are usually great at helping people research stuff. Careers: counselling, teaching, researching, scientist, police work, forensic science, mechanic, repair work, pharmacist, accountant, computer programmer, engineer, auditor, meteorologist etc. Belonging: they usually provide accurate and helpful information and common sense advice, and people may gravitate to them because of this. Humour and small talk can be challenging. They may also need to be careful to listen to their friends and not just analyse them and interrogate them. Connecting with God: they may struggle with the principles of grace, mercy and unconditional love. Point them towards heart connection with God rather than head knowledge, although it is important to answer their questions about God. Security: they can trust their own strengths instead of people. Help them learn to handle confusing seemingly contradictions. Teach them how you cope when things don’t make sense. Ask empowering questions and for their reasoning behind their behaviour. These people are visual thinkers and have the ability to analyse details. Competence: They think with their eyes, pay attention to pictures, diagrams, maps, charts, illustrations. They can visualise pictures, diagrams and colours in their mind. They can easily see and design in their mind. Can tend to daydream a lot. Usually can draw, design, create and build well. Can get distracted in class with a teacher’s patterned shirt. Letter and number identification is easier if you are picture smart. Encourage all children to colour, paint, draw, doodle, create shapes etc so as to activate this part of every child’s brain. They usually enjoy creative writing, fiction and history as the story comes alive in their mind’s eye. Learning & Teaching Methods: Encourage all children in watching, drawing, sketching, visualising, and noticing details. They respond well to “Close your eyes and picture this” or “Does it look right?” when taking a test. Can paralyse a picture smart child by asking “What is that?” when looking at their drawing. Highlighters are a great tool to use for these kids to help them remember details. Teachers can use these words to help picture smart children – illustrate, demonstrate, describe, create, show. Become easily bored if have to listen for a long period of time. Identity: Tend to see themselves by what they have created or have recently developed. Struggles: Picture smart children need to guard their eyes as they can sin by looking at what they shouldn’t. They can easily judge people and things on appearance. Can become critical and negative because of their visual strengths and what they notice. Purpose: Help these children to see how they can use their strengths – creating, design, layout, creating flyers, interior designers etc to help others. Help them to picture Christ beside them and how He would prepare for a test etc. Encourage their visualisation strengths as they apply spiritual disciplines eg picture open heart surgery on their heart and look for any shadows etc when you want them to self examine. Encourage them to picture themselves entering into God’s presence when they confess sin. Ask them to describe God’s body language and facial expression etc. Reading an easy translation of the Bible eg The Message or The Passion can help them picture the scenes and motivate them to read the Bible. Consider the physical space where these children have their daily time with God and also where you hold family devotions/discussions as that can impact on their ability to participate. Careers: art teacher, geometry teacher, engineer, sculptor, interior designer, graphic designer, movie/video game producer, surveyor, pilot, fashion designer, window dresser etc. Also look at their other smarts when combined with picture smart eg urban planning and landscape gardener may appeal to to picture and nature smart child etc. Belonging: May love attending movies, craft shows, art museums and playing video games. Scrapbooking, walking around a city looking at architecture, shopping for new outfits, experimenting with makeup, decorating their bedroom are common to most girls but especially picture smart girls. Connecting with God: These kids value their creativity so may connect best with the Creator God and be inspired that they are created in the image of God and He is the source of their creativity. Stained glass windows, art work, jewellery, movies can draw them closer to God. Descriptive Bible passages will touch them. They may easily see what God is showing them rather than hearing God. Security: May put their trust in their ability to look ‘just right’. May easily become a perfectionist due to wanting their project to look just right or perfect. When disciplining and motivating your children, use rich and expressive language to help them form visual images in their mind. Be careful when asking them to “look at me” during times of discipline as you don’t want them to see any disappointment in your eyes. Thank you so much for recommend Kathy’s book and summarising the 2 types of ‘smarts’ God has created our kids to be! What happens if you or your child is both? It is most likely that you will be more than one smart. One smart may be stronger than another or you may have 2 or 3 strong smarts. That will flavour how each smart is played out eg body and music smart will like to dance to music but nature and music smart may prefer finding patterns to bird calls etc. have fun discovering more about them. I am still working through the smarts of each of our family members and trying to adjust accordingly.